The selection has been done on the basis of NAAC (National Assessment and Accreditation Council) scores and NIRF rankings. HEIs with scores above 3.5 or rank within 50 in NIRF shall fall in Category I in the gradation system, while those with scores between 3.01 and 3.49 and rank between 51 to 100 shalll fall in Category II. The remaining shall come under Category III. Jadavpur University, with a score of 3.68 is eligible to enjoy all the facilities conferred upon it by the UGC. Like other Category I institutions, Jadavpur University too, will be free from regulation regarding commencement of new courses, off campus centres, research parks, skill development courses, and distant learning. It will be free to decide its own fee structure, appoint foreign faculty from all over the world, collaborate with the top 500 universities, attract faculty with handsome packages, and also decide its own syllabus. The mainstream media has hailed this project as visionary, and the Minister of HRD very hopefully states that the goal of Category I universities like ours is to bag a place in the world rankings of the top 100 institutions. However, there are some very serious problems. Jadavpur being a State University, attracts students from remote parts of the state. Students from low income families can afford quality education in Engineering courses to Humanities due to the accommodative fee structure. Last year, the university started a new Masters’ programme in Mass Communication as a self financed course. The fee of this course amounts to nearly 20 times more than that of regular courses. This new course was thought of as an exception last year. The Notification clearly states that new courses will not receive financial aid. Although a necessity to establish new departments and courses persist, such demands will now be met by setting up courses with exorbitant fees. 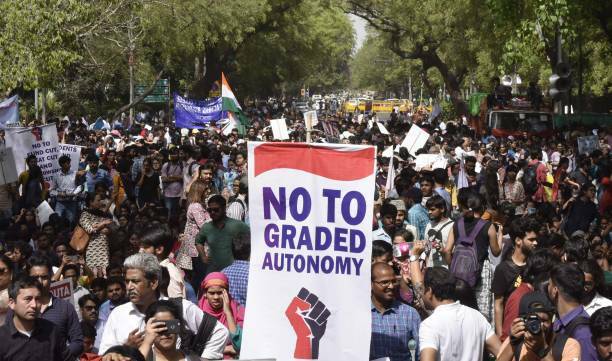 Self financed courses, like anywhere else, will wipe out students from the marginalised sections including SC/ST OBC and other minorities from the purview of higher education. Granting this kind of an autonomous status also creates tension regarding the implementation of affirmative action policies, as the government shall not compel institutions regarding policies much like the case of private organisations and institutions. Jadavpur University takes in a significant number of foreign students every year, who come through their governmental programmes. The process of involvement and exchange that takes place, is highly beneficial for learning and contribution to their disciplines. But it is clear that graded autonomy sees foreign students only as sources of resource generation. The university can, according to its own discretion decide the fee structure of the foreign students. Students from the African countries and other developing countries will be burdened with back breaking fees at the cost of higher education. Moreover, the funds previously used to fulfill our demands pertaining to infrastructure, health centres, sanitary napkin vending machines, translation cells and so on will now be used up to maintain and start new courses and essentially to keep the institution running. This makes no sense for the case of public funded universities. Hence, it is a calculated step towards the path of privatisation. The already existing public private partnership will now be endorsed and so will courses with higher market values. Humanities and social sciences will have to be negotiated with according to the needs of the market. As the Niti Ayog Action Plan suggests, “We should establish and promote norms/standards and/or outcome based certification for institutions that focus on skills and trades closely tied to employment”. The process of abandonment the idea of ‘education for social change’ to ‘education as a skill’ is finally materializing in India. The ‘World Conference on Education for All’ held in March 1990 took the first leap at introducing neoliberalism in education on a global level. It resolved to bring education under the fold of the World Trade Organisation. India too was a part of this. Slowly but steadily private investors grew and so did private institutions. The Birla Ambani Commission (2000) has become a milestone in the course of changing policies of education. The fact that the fate of education in India was surrendered to the biggest industrialists of the country was enough for one to realise the implications. The Birla Ambani Commission among other things, recommended that the Government cannot take up the responsibility to provide higher education and to ban any form of political activity on campuses of universities and educational institutions. The present scenario ascertains the fact that the Birla Ambani Commission is the blueprint for neoliberalism of education in India. The TMC government in West Bengal after coming into power has created a base on which the policies of the BJP can be implemented with ease. In 2011, one of the first things the TMC did, was to issue an ordinance in order to disrupt the democratic functioning of Universities, teachers, students and officials. Not only did the Ordinance do away with elected student representatives in the Executive Council, the highest decision making body of the university, but also made ineffective the University Act(1981), which gave powers to the University within its territory. Every University had its own act, keeping in mind their composition and unique features. The University Act was what made the Universities truly autonomous. In the course of 6 years, the government has imposed restrictions on the activities of teachers, officials as well as students. After disallowing Student Union elections in 2013 and 2016, the TMC government has now found a solution to break the backbone of students’ political activism by imposing an apolitical Students’ Council, that is nothing but a toothless ally of the authorities. Meanwhile, it has been proposed in the Legislative Assembly, that a uniform act be made for all Universities in Bengal. Hence, the simultaneous processes of, depoliticisation and centralisation will immensely serve the neoliberal agenda. Something to the effect of Graded Autonomy had been on the cards for quite some time now. It was in 2005 that the then government pledged higher education as a tradable service to GATS in the Doha round of the WTO. In 2017, the BJP government reinforced the commitment and carried forward the mission more aggressively. This simply makes India a part of the global struggle of students and teachers against the neoliberal system of education already being waged in London, Toronto, Amsterdam, Netherlands, Chile, South Africa. We know how the ruling class has always used education in its favour to make its ideas the ruling ideas. However, it is important to reclaim the idea of education for what it is; an agent of social change. The time has come for us to fight to reclaim education, for the future of generations depend on it. The author is a postgraduate student, an activist and the last elected Chairperson of Arts Faculty Students Union (2017), Jadavpur University.